WITH eateries mushrooming everywhere, Bandar Baru Sri Petaling is becoming a magnet for discerning diners. 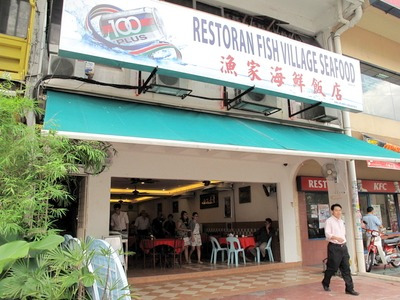 Despite the fierce competition, Sri Petaling Fish Village Seafood Restaurant has still managed to carve a mark for itself by offering something different. It is one of the handful of restaurants there serving delicacies from the sea. They have recently invested quite a tidy sum on aquariums to offer live seafood. Money alone is not sufficient, of course. The restaurant has to be captained by a good chef to keep the diners streaming in. In this case, it is Francis Chew who has more than 20 years of experience at the helm of the kitchen. Even that is not good enough. The plus point of this seafood restaurant is that it is also headed by Mervin Lim who has been running a freight business for the past 10 years, so he knows just where to get the freshest supplies, hence the restaurant’s impressive variety. 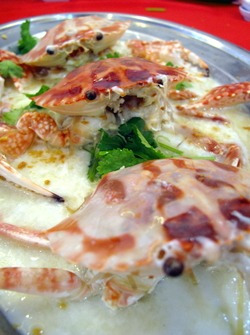 Delicate flavours: Steamed FlowerCrab with Egg. “We get mud crab and mantis prawn from Indonesia, wild tiger prawn from Thailand, lobster and clam from the Philippines and grouper from Malaysia. Besides that, Kuala Selangor offers high quality prawn, mantis prawn, squid and flower crab,” said Lim, adding that they sell five types of grouper. In addition to their respective skills and experience, the duo has also put in much effort to acquire fishkeeping knowledge such as how to set the temperature and get the salinity right. “It is not easy, but we want to appeal to customers with something different as there are already a couple of restaurants here dishing out river fish,” Lim added. Banking on the ingredients’ freshness, Chew likes it steamed or lightly stir-fried with salt and pepper and advises against the strong-flavoured methods such as kung po (stir-fry with dried chilies and dark soya sauce) and kam heong (stir-fry with curry leaf, onion and garlic) even though these cooking styles are still available. Steamed Grouper with Soya Sauce is one of the best-sellers; a dose of soya sauce accentuates the fish’s smooth and firm texture. To highlight the treasures available from Kuala Lumpur, Chew prepared for us Steamed Flower Crab with Egg and Steamed Mantis Prawn with Egg. Normally, mantis prawns are prepared in the kung po style if they are not live, here, the sweet meat of the prawns can be savoured without having to go near the sea. The flower crabs are sweet and the texture is delicate even though they do not offer as much of a bite like mud crabs. They are made more appetising with the accompanying steamed egg, enhanced with a tinge of ginger and Chinese wine. Chew has his own recipe for Butter Prawn; he uses butter instead of egg for the dish to make it moist and aromatic. If you want more than the steamed dishes to try out Chew’s culinary skills, do opt for Nyonya Squid with its tangy, spicy and creamy gravy that will send you gulping down the entire bowl of rice.